Blog e-Genius Crosses the Alps on Battery Power – Twice! 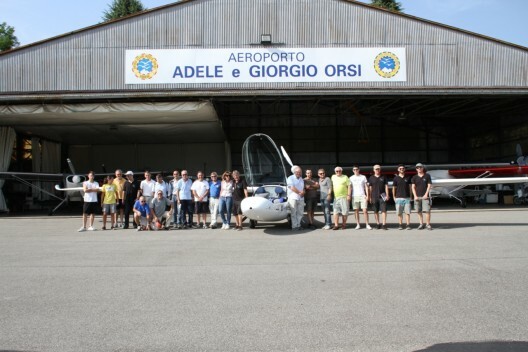 Klaus Ohlmann did the piloting honors, spanning three countries in a little over two hours and landing at the airport Adele and Giorgio Orsi of Calcinate, where they were greeted by Margherita Acquaderni, president of the local soaring club. Club members refreshed Ingmar and Klauss, recharged e-Genius’ batteries and sent the duo back toward Germany with a nice-looking gift bottle of wine. Klaus and Ingmar took a flight path through the Gotthard Pass, stretching the return trip to 365 kilometers (226.3 miles). The steep climb and greater distance added one euro to the operating cost for the homebound leg – 11 euros. e-Genius used only 83 kilowatt hours of electricity for the round trip, equivalent to 9.2 liters of avgas, or 2.46 gallons. The same flight in a Rotax or Continental powered machine would have used an estimated 20 to 25 gallons. A Cessna 150/152 might have had difficulties making the high-altitude climb at all. 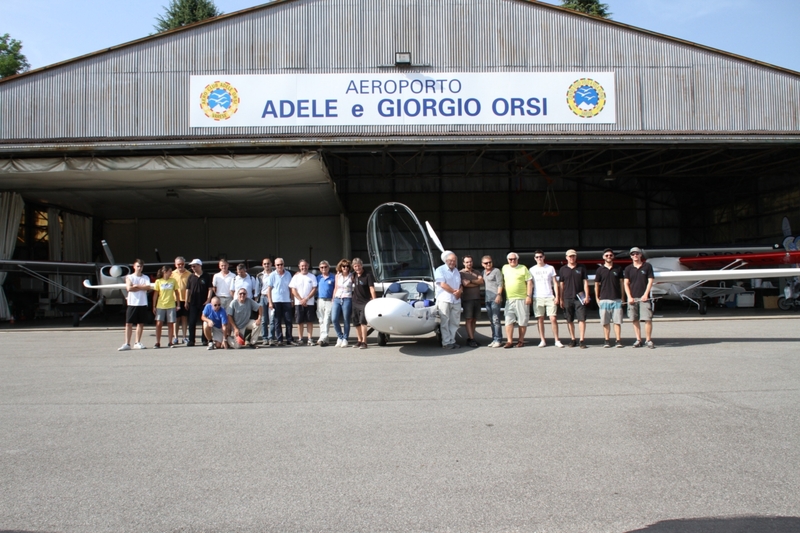 Soaring club members at the Italian airport were prepared to meet the pilots and the airplane. An announcement on the club web site extolled “Klaus Ohlmann , almost a legend in the world of gliding, [who] has won 36 world records FAI , including the free distance of path with three turn points won in 2003 in Argentina, with 3,009 km routes, and to distance in return of 2,247.6 kilometers, always in 2003.” The web site explained that Klaus Ohlmann was also the first pilot to fly over Mount Everest on board a Stemme S10 VT. The site also talked up the virtues of the airplane. “The e-Genius is an aircraft configuration with motor glider, two seats side by side, comes in an electric motor powered by a battery based on lithium-ion technology. The only battery has a weight of about 300 kg and has a capacity of 56 kWh, sufficient to provide a range of over 400 km. “This futuristic electric plane consumes, per 100 km, about 10 kWh, comparable to 0.9 liters gasoline, all with zero emissions.” Noting its second-place finish in the Green Flight Challenge, its 2013 victory in the Green Speed Cup and seven world records set with Klaus in command, the club’s web site made a prediction that did come true. It may have been Independence Day in the U. S., but e-Genius, Klaus and Ingmar showed an independence from fossil fuels, perhaps a struggle that will be as important in this century as the colonist’s fight for freedom in the 18th century. 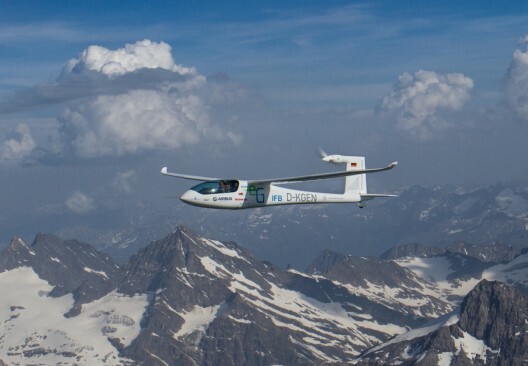 A correction: this is NOT the first time an aircraft with electric propulsion has crossed the Alps. I think that honor goes to Eric Raymond’s Sunseeker, which crossed the Alps under solar power in April 2014. (Editor’s Note: You are so right, sir! Actually, he did it in 2009, too, on his way to the World Air Games in Italy. He won top honors there, by the way. Eric has been the leader in solar-powered electric aviation all along, crossing the United States in 21 hops in 1990, 23 years before Solar Impulse managed the feat. Your editor should have explained more fully that Eric was first, but this was the first two-way crossing in the same day, and the first on batteries only. In all respects, it is still a magnificent achievement and one which shows the potential for great electric airplanes.